Microsoft today launched PowerApps, a new Office-like service that makes it easy for virtually any employee in a company to build basic mobile and web-based business apps — and for IT departments to enable them to do so. The new service is now officially available in preview. As Microsoft’s corporate vice president for its application platform Bill Staples noted during a press briefing earlier this month, the company believes that while employees are now more mobile than ever, a lot of work is still bound to the desktop. Staples believes that the reason for this is that while we have lots of great apps for organizing our personal life and collaborating with teams, there still aren’t a lot of mobile business apps that are able to tap into all of the data that most companies now amass every day. “While companies are increasingly turning to SaaS solutions for specific scenarios like CRM, travel and HR, using services like Microsoft Dynamics, Concur or Workday, most business app scenarios still remain locked on premises, dependent on corporate connected PCs,” Staples writes in today’s announcement. All of this data is stored inside of lots of different systems that aren’t typically connected. At the same time, it’s impossible for IT to write new business apps for every scenario and, as Staples stressed, there simply aren’t enough developers to go around to write those apps anyway. PowerApps aims to take the friction out of the process of writing these apps. Once enabled by IT, users will be able to pull data from both cloud-based and on-premise data sources into their apps. Out of the box, PowerApps will allow you to connect to services like Office 365, Dynamics CRM, Salesforce, Dropbox, OneDrive and on-premise database systems like SharePoint, SQL Server, Oracle, SAP and others. If you want to base your app on data you store in an Excel file you save on Dropbox, for example, PowerApps will happily let you do that. With this, a team could write a custom app to track its recruiting efforts or a sales team could wire up data from Salesforce and other tools to track its efforts. Microsoft offers a highly graphical interface and a set of templates for building basic apps with just a few clicks. The apps are then made available through the central PowerApps app on iOS, Android and Windows Phone, as well as on the web. Sharing them with co-workers is as easy as sending them a link to the app. While this gives employees a lot of flexibility, IT still remains in control and can manage data access according to the company’s policies. For developers, PowerApps also includes Azure App Service, Microsoft’s developer-centric service for building mobile and web apps. Microsoft isn’t sharing any pricing info while the service is in preview. 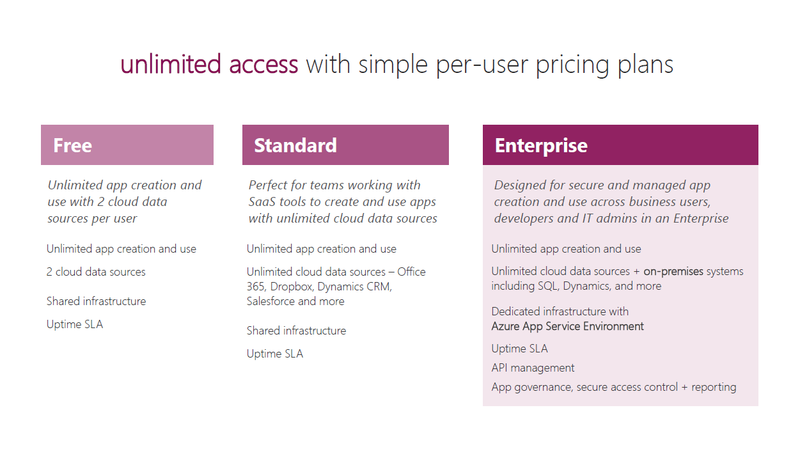 A spokesperson told me the company plans to charge on a per-seat basis, though, so businesses will have a predictable bill that scales with growth and won’t have to worry “about purchasing multiple individual meters to offer the same level of service.” Here is what the pricing tiers for PowerApps will look like. Microsoft, of course, isn’t the only company that’s trying to make a play for business apps. Indeed, there is no shortage of services that promise to make it easy for anybody to write a basic mobile app. We recently featured AppGyver’s Composer 2, for example. Microsoft, however, has the advantage of both name recognition and existing sales channels into the enterprise.